Before I say anything else: this weather + being at home + the anticipation of Thanksgiving with my family = almost too much for me to handle. I woke up in my own bed this morning… in my own room… in my house. And I listened to Christmas music… in my car! I LOVE IT. On another note, I mentioned last time that I would post about my visit with my granddad. What I didn’t know then is that by the time I got around to writing this, I would have so much more to tell! So we’ll just jump right in. When I found out my parents were coming to see my granddad, I wasn’t sure how they would feel about me tagging along. My mom told me that because I was an adult, I had to make that decision for myself, but I needed to keep in mind that he was much different from the person that I saw this summer. The more I thought about it, the clearer the answer became. For me, it basically boiled down to the fact that if I was sick, my granddad wouldn’t let fear stop him from seeing me. And in the moment that I realized the only thing holding me back was the fear of how things could play out, I knew that I had no choice but to go visit him. My granddad and I have always had a special connection, especially throughout these past few years. Even when he couldn’t remember my name anymore, he would come to visit our house and if I wasn’t there, he would constantly ask for me until I finally came home. He told my grandma one time that he liked talking to me because I would look at him- I guess after a certain point, that was a rarity because people assumed he couldn’t understand what they were saying, and they would just talk to my grandma. But I adopted the idea early on that no matter how bad things became, I would choose to believe that somewhere inside of him he could understand what I was saying, even if he couldn’t verbalize it. Not only did it give me a sense of peace, but it made my granddad feel much more comfortable when he talked to me. we've always been buds. 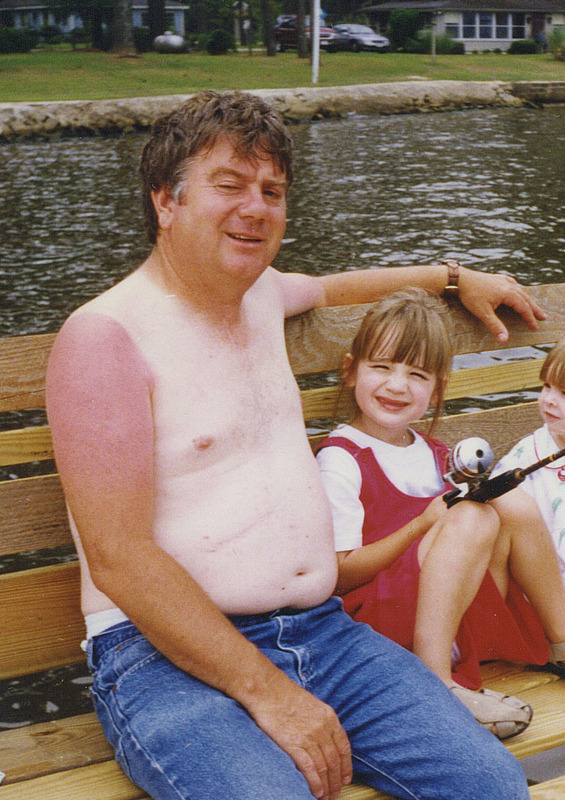 :) ...and if you couldn't tell we were southern before, the farmer's tan should rid any doubts you had. I wasn’t really that nervous about seeing him. I knew things would be different, but I couldn’t really imagine how so much had changed from just a few months before. I pictured him being in a hospital bed, and he would either look at me or he wouldn’t; he would remember me or he wouldn’t; he would talk to me or he wouldn’t… but I never imagined him doing so much and so little all at the same time. I wish I could describe the feeling that set in when I saw the point that my granddad was at from this disease. Part of me just didn’t understand. This was not the man that I saw this summer- he wouldn’t even look up from the ground. He just shuffled around and was totally unaware that I had even walked into the room. Another part of me was weak. It was everything I had not to start bawling as soon as I walked in, because seeing my granddad so debilitated and frail was enough to bring me to my knees. Part of me was really angry. I was yelling at God in my head. I was asking why over and over again- WHY are you doing this to him? WHY are you letting a man who spent his life serving You suffer? WHY, God? Why? I knew that a matter like this was beyond my understanding, but at that point I just didn’t care. I told God I was angry and I told Him that none of it made sense to me… even though He already knew that. Standing in that room may have been the hardest thing that I have ever had to do. I walked into the room expecting that my granddad would look at me and know that I was there to see him. He may not have been able to say “Hey Jordan,” or let me know that he knew, but I was confident that somehow, he would just know. But the whole time I was there, he didn’t even look at me. And it’s not his fault, but it’s just the way it is. The next few days just didn’t go my way. Not only was I discouraged after seeing my granddad, but a number of other things happened that just kept bringing me down. As these things continued to pile up, I practically became numb to all of it and when people would ask me about it, I would tell them that it was just one more thing going wrong in my life. I went from being upset to just genuinely sad about it all, and in all honesty, it was kind of scary. I didn’t want to be sad and I didn’t want to be discouraged but that was just the way things were going. But then, things began to turn around. My uncle texted me and asked if I could babysit my little cousin this past weekend so that him and my aunt could go visit my granddad. Because of my terrible week, I asked if I could just stay with them for the weekend so that I could get away from campus and take a break for a little while. He said that was fine, and made plans to pick me up on Friday. On Thursday night, we all reached our breaking point. We’ve been trying to get my granddad to a facility closer to his home for quite some time now, and there was just nowhere for him to go. My uncle had been making calls all day trying to find somewhere for him to go, but nothing was working out. He said that night he told God that He had to open a door, because there was nothing else my uncle could do. My grandma said that same night that she told God she didn’t know what to do anymore. She told Him that my granddad had helped so many people, and she prayed that God would just bring my granddad somewhere closer to home. And on Friday morning, a spot opened up at a facility that is no more than 10 minutes away from his home. They had been telling us for the longest time that they had no room, and all of a sudden, a bed opened up. God opened a door. …or, a bed. So my granddad is now in a place where everyone knows who he is, they take great care of him, and my grandma can make the 10-minute drive to see him any time that she wants. My mom and I talked about this on Sunday night, and she made a great point. God’s timing is absolutely perfect. As I was standing in the room with my granddad getting angry with God, He knew that it just wasn’t time for my granddad to move. Because all too often, we say that we’re going to give God the glory for things that happen, as if we did it ourselves and we’re nice enough to give God credit– when in reality, nothing could happen without Him. So when Thursday night came around and we had all reached the point of complete hopelessness, we knew that there was nothing we could do to change my granddad’s circumstances. But God could- and he did. And believe me, He received all of the glory because we all knew that this came out of nothing that we did. My family worked very hard to get my granddad out of the hospital, but the praise for it actually happening goes to God completely. I may be the best example of someone who lacks any understanding of God’s timing. Even though I say all of the time that God has a plan and I trust it completely, I am constantly asking God when He’s going to make things happen for me. I don’t want to be patient, and a lot of times I only want to trust God’s plan if it is going to be delivered quickly. But this situation has served as a huge wake-up call for me in the sense that I have to remember the importance of being patient. God’s timing is perfect, and when we realize that simple truth we will have such a greater sense of peace about our lives and His plan for us. One more thing: This song has been so inspiring to me these past few days, and really goes along with my post well. It’s called “Blessings” by Laura Story- many of you have probably heard it before, so enjoy!